Click on any of the links below to visit a specific section. 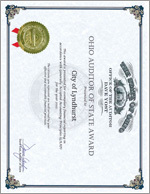 The City's financial statements are produced in accordance with Generally Accepted Accounting Principles. 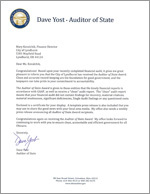 The Auditor of State has issued an opinion that confirms compliance with these principles for the 2012 accounting year. 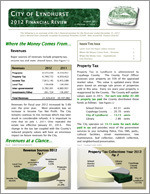 The 2012 Annual Financial Report is available for public inspection between the hours of 9:00AM and 4:00PM at the office of the Finance Director. 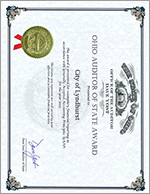 Additionally, the Audited Annual Financial Reports of the City of Lyndhurst can be viewed online at www.auditor.state.oh.us. To protect and to enhance the fiscal integrity and efficient management of the city while maintaining citywide programs and initiatives. 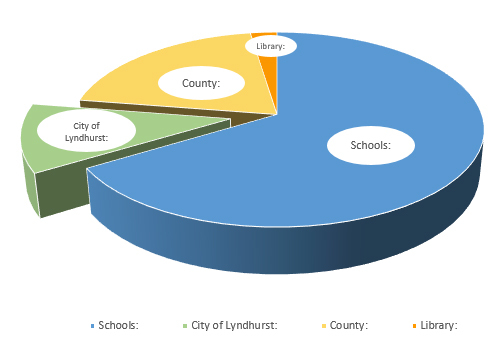 The Finance Department is responsible for the accurate accounting of all receipts and disbursements of the City of Lyndhurst, representing the city in most financial matters and abiding by all laws governing proper municipal financial control. The department records all assets and liabilities, keeps an accurate account of taxes and assessments, collects all monies for the city and makes all necessary disbursements on the city's behalf. In addition to accounts receivable and accounts payable, the Finance Department prepares payroll, processes purchase requisitions, and oversees fixed assets. The municipal income tax rate is 2.0% on all wages and profits earned within the City limits. 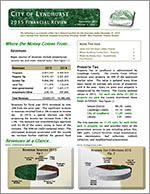 Residents are allowed a credit of 50% of up to 2.0% of the taxable income. The Regional Income Tax Agency (R.I.T.A.) 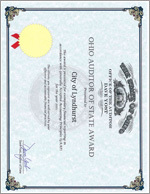 collects and maintains the tax records for the city. 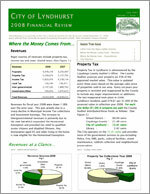 All municipal tax filings and any questions should be directed to R.I.T.A. 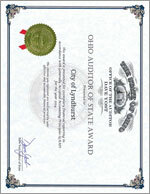 at (800) 860-7482 ☎ or www.ritaohio.com. In order to provide our members and taxpayers with up to date communication, the Agency has established a Twitter Account. We started to post "tweets" on Friday, March 13th. 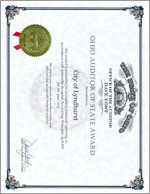 Please follow us on Twitter @RitaOhio. The residential real estate tax rate is 143.13 for tax year 2017 collected in 2018. The effective tax rate, which is the rate you pay after reduction is 103.38. Additionally you receive 12.5% in rollbacks. 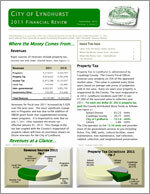 There are two simple ways to estimate the real estate tax paid in 2018. ➜ Market value $150,000 x 35% = Assessed value $52,500 / 1,000 x effective rate 103.38 = $5,427.45 x 87.5% rollbacks = $4,749.02 estimated tax per year. ➜ An easier method is to simply take the market value of your home $150,000 x 3.19% (the percentage to market rate) = $4,785.00 estimated tax per year. Based on the $4,785 estimate - Where do your real estate tax dollars go?